Last year’s epic birthday shot. Come celebrate once more and this time, propose a session! NYC’s School of Data is coming up on Saturday, 4 March 2017! 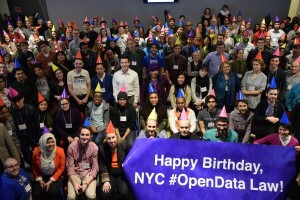 We are honored to celebrate the FIFTH anniversary of New York City’s Open Data Law and International Open Data Day. We’ll host thoughtful discussions around digital privacy, encryption, smart cities, open government, and technology, we want our community to be empowered to improve lives and neighborhoods through data and technology. NYC’s School of Data is a community conference built with your input and involvement. For this year’s conference, we are reserving discussion sessions to be led by YOU! We are looking for eight to ten highly-interactive, community driven sessions, panels, or workshops. Simply put, no sales pitches. These 45 min long time slots should be diverse in representation and help demystify the world we live in. Open Data: Open government data (datasets, maintainers, APIs) and how community based organizations and businesses can better use municipal data. Privacy & Security: Ensuring individuals know how technology collects information on them and how they can help control that technology. Policy & Legislation: State and local legislatures are the front lines for our democracy, these sessions will outline our next steps in municipal civic tech policy and legislation. Civic Engagement: If democracy is the consent of the governed, how do we engage with those frameworks for local democracy. Education: Sessions to explore existing Computer Science and Open Data Education and Curriculums. Submissions will be reviewed on a rolling basis and the deadline for submissions is February 10th.